Not your everyday concert, and you probably had to be there to believe it because seeing or reading about it isn't enough. The performance of "Sila: The Breath of the World" that took place in three disparate sites in Washington recently was a communal event, bringing audiences and musicians together in more ways than one. Composer John Luther Adams, a Pulitzer-prize winner (the accolade always necessary to quote), had been commissioned by both New York's Lincoln Center and the Washington Performing Arts Society to present an outdoor hour-long piece involving singers, brass players, percussionists and strings. It was as much a meditative exercise as, well, music of a kind far different from the norm. 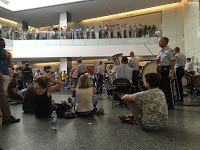 The U.S. Air Force Band did the honors in Washington, minus singers, though a few 'civilians' of assorted stripes wearing plain white shirts and dark trousers were included. Band members turned out in summer gear: short sleeves, long blue trousers, insignia on their sleeves. Saturday afternoon's event - scheduled originally for the Thomas Jefferson Memorial - was moved at the last minute under threat of storms to a second floor open area at the Museum of American History that featured a balcony where a host of musicians stood with blue horns and various woodwind and brass instruments. 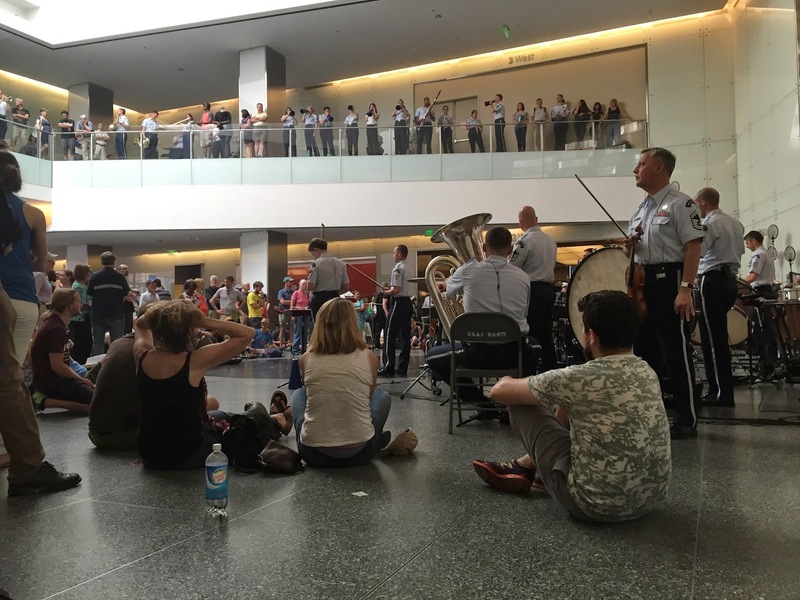 Two tubas were on the floor below next to a wild array of percussion and strings. Everybody was in motion, or appeared to be. At one point, violinists pulled bows across metal bars. Other violinists strolled among the onlookers engaged in the action.. Onlookers walked freely among musicians engrossed in a complicated computerized score. What appeared to be a spontaneous outpouring of sounds in various registers was actually a carefully calculated score. Each performer was wired to receive instructions about what they should do and how long. Most audience members stood watching in amazement - the ones who weren't seated on the floor with their eyes closed in serene repose. Adams himself sat to one side in a folding chair, hardly moving at all, until the finale signaled by a gradual elimination of instrumental sound, leaving only public noise in the museum corridors.